Q: How long will an Ammonia Alert work? A: The Ammonia Alert sensor should last about a year before you should need to replace the sensor. To test it gently hold the card over a bottle of ammonia; the sensor should quickly change to a dark blue. It may take about an hour for it to return to its original color. Q: I have another test kit that showed positive for ammonia but the Ammonia Alert never changed color. Is it still good? A: Most likely the other test kit was testing for total ammonia. Total ammonia includes both free (NH3) and ionic (NH4+) ammonia. The Ammonia Alert only measure free ammonia because that is the harmful form. Ionic ammonia cannot harm your fish. However, as pH rises, a greater and greater percentage of the total ammonia will be converted from ionic ammonia to free ammonia, so knowledge of total ammonia is also important. 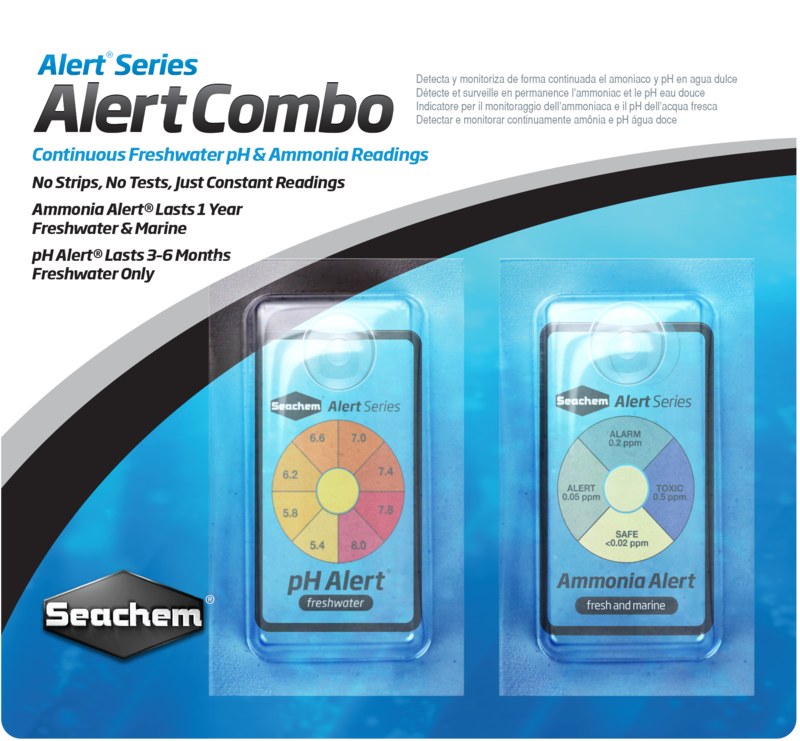 Q: Does Ammonia Alert properly detect toxic ammonia in the presence of Prime? A: If the Prime has not complexed with the ammonia yet it will detect it, but it won't detect it if the Prime has already complexed it (which makes sense because when Prime has complexed with the ammonia it is no longer toxic). If you want to know the total ammonia level (free, ionized and complexed) you would need to run a Total Ammonia Test (like with our MultiTest Ammonia. Q: I bought a Ammonia alert from Pet store but it doesn't not work at all after following all the instruction -How can I get my money refund back as it is not working at all and the COLOR NEVER CHANGES? A: The technology of this device is very unique to our company and has been an excellent seller for many years to hobbyists, breeders, and public facilities alike. 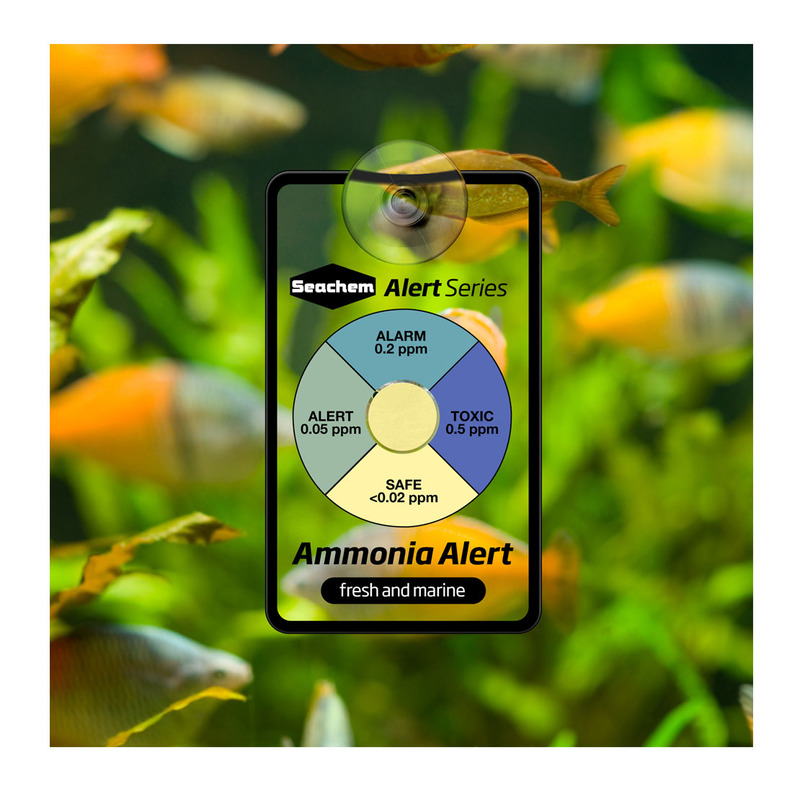 The Ammonia Alert is designed to change color in the presence of free (gaseous) ammonia, not ammonium (ionized ammonia) which is harmless to fish and other aquatic life. The longer it is left in a particular body of water/aquarium, the more sensitive it becomes to that water. Most conventional test kits test total ammonia which is a combination of free ammonia + ammonium = total ammonia. PH is the determining factor on what type is present. If your pH is acidic (below 7.0), it is chemically impossible for ammonia (harmful gas) to exist. Yet a total ammonia test kit will register a reading because it detects both the free ammonia (harmful gas) and ammonium (harmless ionized form of ammonia). 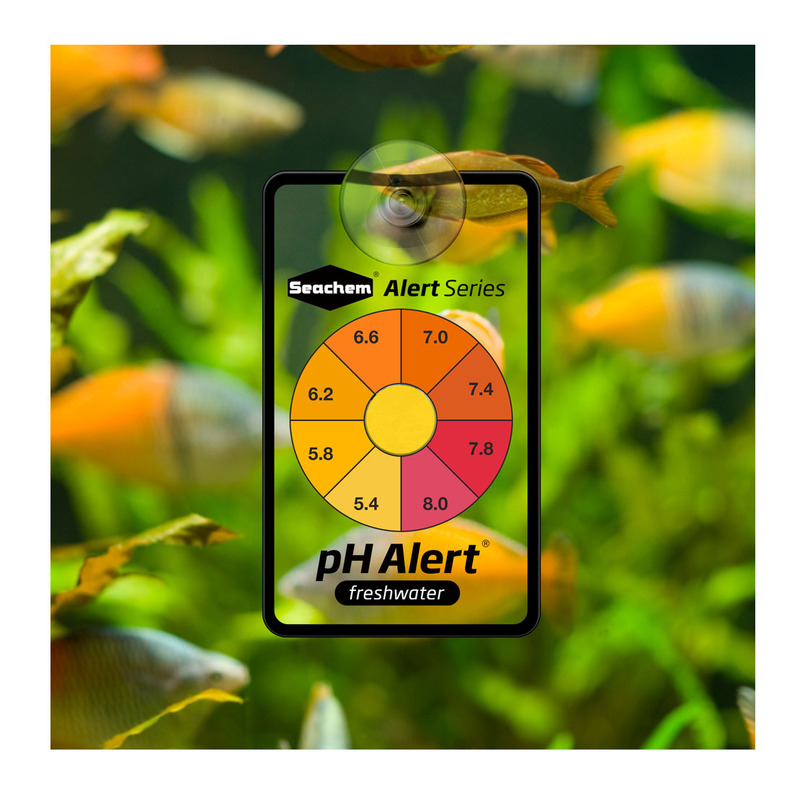 The more basic your pH becomes, the greater the chance of ammonia existing. Example: If you have 1.0 ppm of total ammonia and your pH is below 7.0, then 1.0 ppm will exist as ammonium. Ex. If you have 1.0 ppm of total ammonia and your pH is 7.6 (slightly basic), then of that 1.0 ppm total ammonia......only .2 or so would exist as a gas and the other .8 would exist as ammonium. There is one simple way to tell if our Ammonia Alert is functioning properly, simply hold the sensor over an open bottle of something containing ammonia (Windex glass cleaner will work) as it will detect the fumes/gas and change color. Please be sure not to touch the sensor in the middle of the plastic card as the oils from your skin may clog the pores on the sensor. 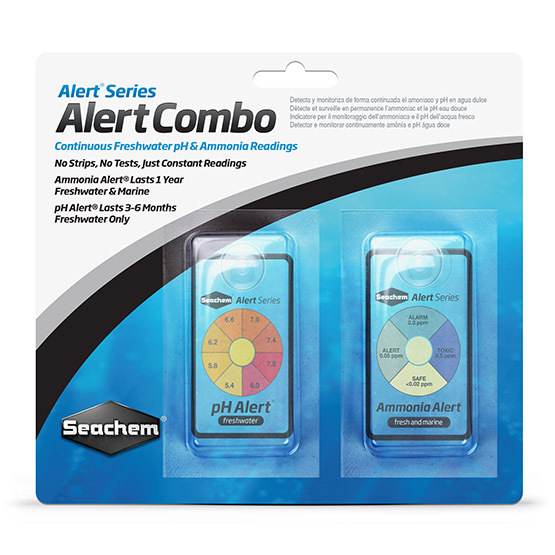 Q: Does the ammonia alert monitor work accurately if you are using Ammo Lock? A: Yes it does work accurately, however as a product like Ammo Lock is removing the ammonia the transition back to yellow will take some time, so don't be concerned if you don't see an immediate shift back to yellow. The Ammonia Alert is always faster to respond to increasing ammonia levels than to decreasing. Q: I just bought an ammonia alert and it has been at a grey setting for days. What does that mean?